Thanks for loving our DailyEnglish (每日英文). Because of your support, today, it climbed to the 1st trending APP and 2nd new free APP of "Books & Reference" on Google Play. 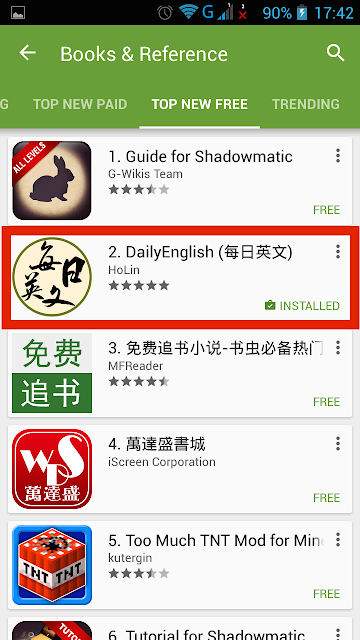 Here is its link: https://play.google.com/store/apps/details?id=com.holin.DailyEnglish. We'll continue updating its contents. Hope you'll like it and spread its information. 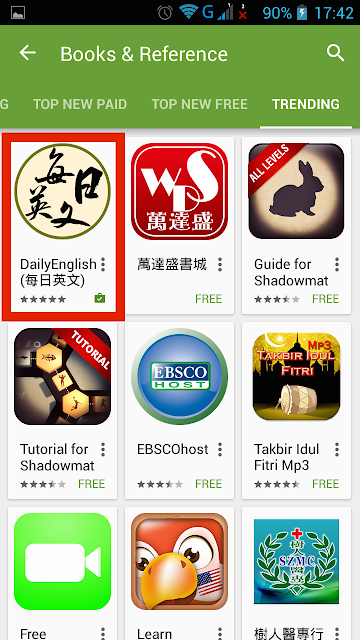 Everyday, one English slang and its example with four accents will be updated. Users need to choose the correct Chinese meaning from two options of Chinese translations for the English slang. Next, the APP will show the correct answer and how many days the users have continually used. Finally, users can recall the history of English slangs. ps. Everyday, the APP needs the Internet to update the English slang, when users execute it for the first time. Everyday, one English sentence with four accents will be updated. Users need to choose the correct Chinese meaning from two options of Chinese translations. Finally, users can recall the history of English sentences. ps. Everyday, the APP needs the Internet to update the English sentence, when users execute it for the first time. You'll play a famous writer and demon slayer. In your book signing event, there are a lot of monsters. The mission for you is shaking hands with human and sealing monsters. You are a member of 'Kiss, Kiss, Damn'. You get a mission that is when seeing a couple or two people who have an opportunity to become a couple, you need to separate them (by throwing pie) with your proud sense of justice. Therefore, they won't continually harm the whole society. On the other hand, if you see a couple who was fighting, estranged, or in angry, you just let them go. Once you make the correct and appropriate action, you will get a certain score; otherwise, you will be penalized. Hurry up! 'Kiss, Kiss, Damn' member! How many couples you can separate? Let children learn how to distinguish differences from the game. In practice, children will train their cerebral hemispheres, especially right hemisphere, while searching different pictures. Let children learn animals from the game. In practice, children will know the animal's name while recognizing different animals. In practice, children will identify the owner of shadow while recognizing different animals.